I highly recommend Lynsey and the Pilates classes at Physique Rx’d! From the beginning, Lynsey devotes personal attention to ensuring you have the basics necessary to thrive in class. She works with you to make sure you are comfortable with the movements according to your body and what works best for you. I have scoliosis and have NEVER found a gym routine that: #1. Doesn’t hurt my back, #2. That I like, and #3. That I can stick with. Lynsey has changed that for me! Since starting classes, my back pain has decreased to almost non-existent, there’s a noticeable difference in my core strength and I have increased flexibility. Lynsey’s energy, enthusiasm and encouragement makes you want to come back and see her as much as you can, not to mention, try your hardest in class. She will correct your form, keep you engaged and focused, all while keeping the class fun and light-hearted! I had no idea what to expect when I met Lynsey for my first Pilates session. 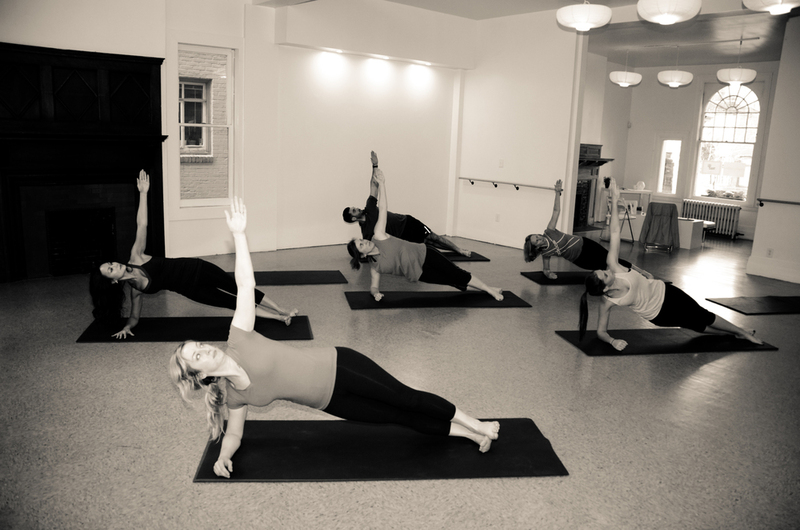 I knew nothing about Pilates, and had to ask whether it was for guys (it is). All I knew was that every muscle and joint on my body felt tight and my back and neck were in frequent spasm – likely from sitting at a computer all day, coupled with years of the same tired weightlifting routine at the gym. From the very beginning, Lynsey made me feel like I found the right program and the right teacher. She started me at exactly the appropriate level, adjusting techniques gradually so that I was making steady progress without getting discouraged. Her infectious enthusiasm for Pilates makes each session fly by, but it is a serious workout, no matter what your level. Lynsey knows her stuff. My progress so far beats any physical therapy I've ever seen, based on improved range of motion and core strength in a short amount of time. I call Lynsey my lifesaver. To anyone who's curious, I encourage him or her to check out her program. In February 2017, Physique Rx'd was placed in the top 15 Pilates Studios in the Pittsburgh Region! I am truly grateful for this recognition! Throughout my life, Dance and Fitness have played an important role in gaining poise, confidence, and living a healthy, athletic lifestyle. After receiving my dance degree and retiring from an exciting, worldly dance career; I had another passion for helping others experience the thrill of being stronger, flexible, balanced, staying fit! I have a profound level of respect for the body…I believe it is the most exquisitely designed machine on earth and we must take care of it. To change your body, you must change your mind! With 15 years of training under my belt, I am still enthusiastic, if not even more now that I see what is happening in society today. It’s that time of the day that you give back to yourself and your body will thank you for it! At Physique Rx'd, located on the Northside of Pittsburgh, (known as Allegheny West) Lynsey scales the workout to your personal fitness level. You will always receive Personal coaching every group session! Every group or private session, is designed to increase Core strength and flexibility, gaining strength and endurance and improving alignment and balance! The results are endless: Improved posture, inches lost, flat abdominals and beautifully sculpted muscles! At physique, you will learn the original, classical movement of Joseph Pilates, following the principles: CONCENTRATION, CONTROL, CENTERING, BREATH, FLUIDITY, AND PRECISION. To avoid hitting a “Plateau” Lynsey puts a twist on the movement adding more spice and fun to each workout! Increased strength and endurance! You will be able to do a full body weight push up in no time!! Increased flexibility and joint mobility! No more stiff muscles! Flat Abs! You will feel great in your clothes! Inches lost around hips, waist, and thighs! My goal is to get you into that favorite pair of jeans! A lifted Toosh! Strengthening the Gluteal muscles is a key component to better posture and better daily activity! Improved Posture! Good posture prevents back pain and makes you look poised and confident! More energy, lower stress levels, better sleep patterns! My goal is to get you in the best shape of your life! With some patience, consistency, and dedication all of these results are possible! This annually button locks you in for the whole year. It is an agreement to make your monthly payment each month from the date of purchase, It’s a little perk for continuing your practice with us for the year! At Physique Rx'd, Lynsey scales the workout to your personal fitness level. You will always receive Personal coaching every group session! Every group, private session or personal training session is designed to increase Core strength and flexibility, gaining strength and endurance, and improving alignment and balance! The results are endless: Improved posture, inches lost, flat abdominals and beautifully sculpted muscles! Contact us today for a consultation or introductory session. Lynsey has the right fitness prescription for you!